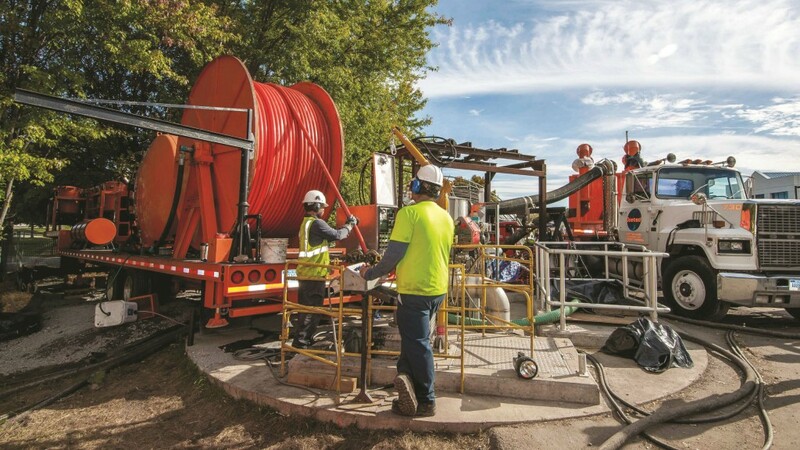 Michigan-based Doetsch is a 118-year-old firm whose services include small- and large-diameter sewer cleaning and inspection, catch-basin cleaning and hydro-excavation (or the use of pressurized water and air to remove soil). The project was a 5,700-foot, 66-inch diameter sewer segment feeding the Robert O. Pickard Environmental Centre, a wastewater-treatment plant in Ottawa’s east end that processes an average of 390 million litres a day. Doetsch was first contacted about the project by engineers at the local office of Stantec, who had read in a US-based trade publication about a 9,100-foot, 72-inchdiameter sewer Doetsch had completed in Nashville in 2012. The company had finished that job in three runs: one at 2,900 feet, another at 1,600 feet and a final one at 4,600 feet. Joe Schotthoefer, Doetsch’s vice-president of operations, met with officials from the City of Ottawa in March 2013. The company’s five-person crew arrived on the jobsite in September of last year, as a subcontractor to Ottawa-based environmental firm Clean Water Works. The Hyjector system works by sending water pressurized to 2,500 psi through a hose to a cleaning head with jets angled back toward the entry point. That provides the thrust needed to both pull the head down the pipe and loosen the debris. In all, the Hyjector uses roughly 750,000 litres a day. Once the system hits a predetermined point, workers winch it back, using the jets to pull the debris along. This “aqueous shovel,” as Schotthoefer calls it, also works in lines that are full of water, as was the case in Ottawa, eliminating the need to bypass or shut down the sewer. Something else that sets Doetsch’s system apart, according to Schotthoeffer, is its focus on reducing water use. An ex traction pipe removes the wastewater and sediment produced by the process and pumps it to the Grand Volumetric Recycler, which filters out debris and sends the water back up to the cleaning head. To complete the Ottawa project, Doetsch had to overcome three main challenges: the pipe’s 5,700-foot length (with no access points along that distance), the close proximity to the treatment plant and the line’s depth – it is 65 feet down. “We’d gone out to 4,800 feet on a previous project, so we didn’t have any doubt that we could accomplish this,” says Schotthoefer. But the line’s depth slowed the extraction of debris, increasing the risk that material could slip through and make its way into the treatment plant. That meant Doetsch had to take extra precautions when it came to handling the sediment it pulled out of the line. The segment was sonar-inspected upon completion of cleaning, and the inspection showed that its capacity was restored to 99.9% of the original design.